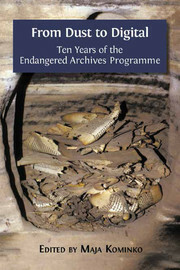 1Ten years on, the broad objectives of the Endangered Archives Programme (EAP) remain unchanged. The EAP continues to bring into the international research domain neglected, vulnerable or inaccessible archival materials relating to “pre-industrial” societies worldwide. It does so by providing relatively small grants to individual researchers to find and copy endangered or vulnerable material. 2The reach of the EAP has been global, supporting a remarkable range of dedicated people — not just professional archivists and academics but independent researchers and amateur enthusiasts of the best kind. Some six million pounds in 240 grants has now been given for archives from Argentina to Zambia, for the digital preservation of around 400 manuscripts in Ethiopian desert monasteries, of piles of paper decaying in institutions without the resources to look after them, of boxes of shellac records and early tape recordings and Saharan rock inscriptions. Grants have also led to the discovery of unknown and important archives in private hands, such as manuscripts of the minority Cham people in Vietnam and handwritten records of village customary law in southern India. 3All this digitised material is now freely available to academics, individuals and communities, in both local archives and through the British Library website. This volume shows the breadth and quality of the scholarly activity that the EAP has made possible. Its impact, however, goes much further than that. 4Against this background it is not surprising that an independent review in 2010, after the first five years, found the EAP to be innovative, worthwhile and successful in the eyes of participating scholars both internationally and in the home countries of the archival projects concerned. Much of this success reflects two key decisions taken at the start of the programme: to administer it through a world-class institution — the British Library — with a global reach in terms of skills and networks; and to recruit an international panel of experts to guide its decisions on policy and on individual grants. The contributions of the library and the panel have been significant in steering the EAP through the two main challenges we have faced since 2004. 5The scope of the programme, originally conceived along conventional lines, has been challenged by applications from the start. The current approach has evolved through pretty continuous discussion at panel meetings about such fundamental questions as “what constitutes an archive” and “what constitutes pre-industrial society”. In practice, there has been a widening of the definition of “pre-industrial” or “pre-modern” in response to the expressed needs in the field, as evidenced by applications and the cases they make for importance and vulnerability. Some risks affect material whatever its age — storm and tempest, political instability — but paper used from the end of the nineteenth century and audio visual materials in the early twentieth century are particularly vulnerable to the ravages of the environment and the innate fragility of the media. The panel’s approach is subtle — there is no single cut-off date. This allows the issues of risk and importance to be judged on their merits in individual circumstances. 6The EAP’s focus has always been on access and preservation rather than on conservation. In 2004, worldwide access through the web was not envisaged. The digitised, or in some cases microfilmed, master copies were expected to be viewed in in-country local archives, with back-up copies available to view in the British Library, or mailed to researchers who could not get there. 7By 2010, development of the internet and the expectations of scholars had made it clear that the route to dissemination needed to be via the British Library website which was not subject to the vagaries besetting access to material elsewhere, especially in less developed countries. This presented a major challenge. Placing future material online would be relatively easy. Dealing with the material already deposited — approximately 100 projects, a huge variety of subject matter, digitised by different hands — has been more challenging. A single project might produce five terabytes of material, or in one instance, fifteen terabytes. Sound recordings and videos presented further difficulties, but this is being worked on, with the aim of streaming recordings, where rights have been cleared, through the British Library Sounds website. 8Curating and cataloguing this has been a huge task for both curatorial and technical staff. But now, this enormous amount of newly digitised material is free to view online via the British Library website. A significant amount of the new material is in a wide variety of non-roman scripts. It will enable new scholarship and new collaborations by both western and non-western scholars and underline the volume and value of writings in other scripts. 9More recently, in 2013, the final report from The Global Dimensions of Scholarship and Research Libraries: A Forum on the Future, identified the EAP as one of the most promising initiatives in efforts to align research library agendas with globalising scholarship and teaching. 10In addition to delivering on its core objectives of preservation and dissemination for the benefit of scholarship worldwide, the EAP has also secured further benefits, in general unforeseen at the start. Perhaps the most important of these is the impact on communities where the archives are sited. 11In fulfilling its aim, the EAP builds the capacity for local communities to continue to care for archival sources beyond the life of a project. It does this by preferring to train local people to help deliver projects rather than employ experts from overseas. The equipment is deposited with the archival partner for further use after the project has ended. And the EAP, through the British Library, offers outstanding technical and general support, which is highly valued by those leading projects. 12The international status of the British Library and its involvement in the programme has had significant impacts locally. Archives in many developing countries are poorly funded and personnel employed there generally struggle to protect their collections. The involvement of the EAP has meant that governments and universities have been made aware of the value of the materials they possess and have sometimes pledged to develop a strategy for long-term preservation and to enhance their support for archives more generally. 13One of the great pleasures of being involved in the programme is to read the final reports, which express profound thanks for saving part of a group’s heritage for future generations. This is particularly true for minority groups whose collections are often dispersed in private hands, with much of their heritage already lost. The value of the EAP lies in the fact that it does not remove items from their owners, unless they are happy for this to happen. It therefore overcomes the concerns that people may have about the loss of their material heritage. At the same time, the free open access to the materials through the British Library makes them available to anyone with an internet connection — this brings to light the material held in remote or unknown archives, and increases the interest of researchers to visit those archives. 14Overall, the EAP is generally seen to be working in the interests of local people rather than that of the British Library, which has not often been their historical experience of contact with outside groups. The involvement of the EAP has also raised the esteem of local cultures and their history, and those who have been employed in projects clearly take great pride in being involved. The excitement felt by local people, which emanates from the reports, is both rewarding and humbling. 15The work of the EAP is still unfinished. Archives remain at risk from war, theft, natural disasters, climate change, neglect and planned or accidental destruction. Recent events, whether the hurricane which swept through the Philippines in 2013 or the unrest in the Middle East, only serve to underline the continuing importance of the work of the EAP’s grantees. CASE, Anthea. The Endangered Archives Programme after ten years In : From Dust to Digital : Ten Years of the Endangered Archives Programme [en ligne]. Cambridge : Open Book Publishers, 2015 (généré le 21 avril 2019). Disponible sur Internet : <http://books.openedition.org/obp/2213?nomobile=1>. ISBN : 9782821876262. Case, Anthea. “The Endangered Archives Programme after ten years”. Kominko, Maja. From Dust to Digital : Ten Years of the Endangered Archives Programme. Cambridge : Open Book Publishers, 2015. (pp. XLIII-XLVI) Web. <http://books.openedition.org/obp/2213?nomobile=1>.